Pep Guardiola is optimistic about welcoming Benjamin Mendy and Ederson Moraes ahead of their top of the table clash on Sunday. While Ederson suffered a knock in the midweek defeat at St James’ Park raising doubts about his chances featuring against the Gunners. “Today, except Vinnie, the others have taken a training session,” he told the club’s website. Pep equally spoke about the threat posed by the North Londoners with the Spanish manager wary of what he feels is a deadly trio. “Unai Emery has done quite well in his first season with new players,” he said. 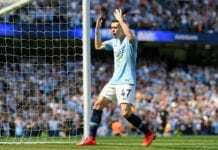 City are five points adrift league leaders Liverpool and would be hoping to reduce the gap when they trade tackles with Unai Emery’s men. On the other hand, Arsenal will be doing their best to consolidate on the fourth position with the race turning into a three horse race.